I Was Involved in a Bus Accident. Can I Still File Suit if the Negligent Driver Died in the Accident? Any time someone dies in a wreck, it is a tragedy. If you were fortunate enough to survive a deadly bus accident, you may have reservations about pursuing your legal rights. But, at the same time, you have sustained serious injuries which are preventing you from working while medical bills and regular household expenses pile up. Under Tennessee law, you are absolutely entitled to pursue the estate of the negligent driver -- whether it was the bus driver or another motorist. Usually, the claim will simply be processed through the negligent driver's insurance company. 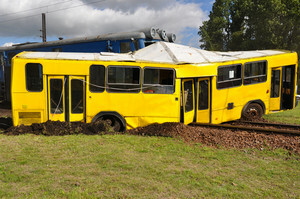 If you would like to discuss how to proceed with your claim from a bus accident, contact our experienced team today. We have more than 80 years of experience in representing injury victims and we can help make sure you get the compensation you deserve while at the same time being respectful of the loss of life involved. Contact our bus accident team online or call us anytime of day 615-742-4880 or toll-free at 866.812.8787 for a free, no-obligation consultation.